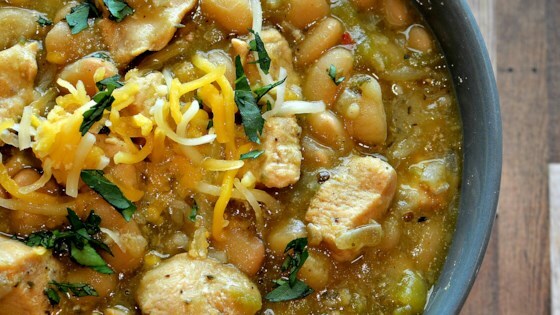 "White chicken chili using dry great northern beans cooked in a multi-functional pressure cooker. You can make this ahead of time using the pressure-cook mode and then switch over to slow-cooker mode." Turn on a multi-functional pressure cooker (such as Instant Pot(R)) and select Saute function. Pour in oil. Add chicken pieces to the hot oil and saute until lightly browned, 5 to 7 minutes. Add onion and garlic and saute until soft and translucent, about 5 minutes more. Add enchilada sauce, dry beans, broth, green chiles, oregano, and cumin to the pot. Close and lock the lid. Select high pressure according to manufacturer's instructions; set timer for 45 minutes. Allow 10 to 15 minutes for pressure to build. Release pressure using the natural-release method according to manufacturer's instructions, at least 25 minutes to allow beans to fully cook. Unlock and remove the lid. Garnish chili with shredded Cheddar-Monterey Jack cheese blend and cilantro. This zesty white-bean chili packs some heat! You can use chicken thighs in place of breasts, if you prefer. Used Chicken thighs instead of breasts. A really good recipe. I would used some chili's with a little more heat and yes I would make it again! I did cut down on the beans by 1/2 cup. The beans were just a little underdone so I would increase the time by just about 5 minutes.